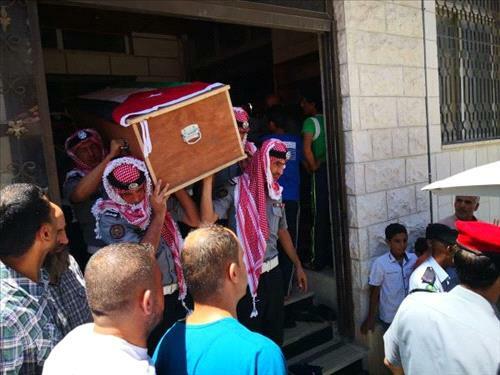 AMMONNEWS - Thousands of mourners Saturday flocked to Jerash's town of Souf, for the funeral of Sergeant Ali Gougazeh, who was killed when an Improvised Explosive Device (IED) exploded under an on-duty gendarmerie vehicle. The IED, which had been planted in the soil underneath the vehicle, also wounded other five members of the patrol. Members of the Gendarmerie forces marched alongside his flag-draped casket through the streets of Souf in a military funeral, and then carrying it into the town's cemetery where the fallen officer was laid to rest. Taking part in the funeral were the Interior Minister and directors general of the Public Security Department, Civil Defence Department, General Intelligence and Governors of Jerash and Irbid.